Since when have the 80's come back with such full force? I know fashion comes and goes. I wore bell bottoms in high school and wore a lot of styles from the 60's and 70's. But...there is one decade that I think really does not deserve a comeback, and that would be the 80's. Some of you may like the 80's, but all I can think of is huge bangs, fluorescent colored scrunchies, caboodles, LA Gear and more. And to be honest, I don't think these past trends deserve a comeback. My mom and I were out shopping today and it seemed that at every turn I took, I was smacked in the face by trends from the 80's...trends I don't think should be making a comeback. 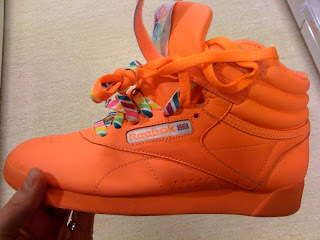 There are the brightly colored high tops, jean everything and zippers all over the place. Me not like. Please fashion designers, skip the 80's and come up with a trend that won't haunt me later in old photos!